All The Bachelorette JoJo Engagement Ring Proposal Details! Millions of fans watched The Bachelorette JoJo Engagement Ring Proposal with great anticipation. The ring was a large diamond oval engagement ring given to her from Jordan Rodgers as he proposed on the season finale of The Bachelorette television show. Amazingly enough, Jojo’s stunning engagement ring is similar in style to Ziamond’s Blake Lively Inspired Oval Engagement Ring as shown below. Oval cubic zirconia engagement ring with micro pave set band in 14k yellow gold by Ziamond. 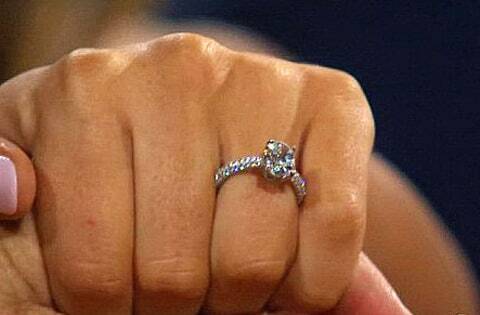 The Bachelorette’s JoJo engagement ring was the talk of social media and is sure to become one of this year’s most sought after look. Ziamond has all the engagement ring details so you too can get the same look for a lot less money. 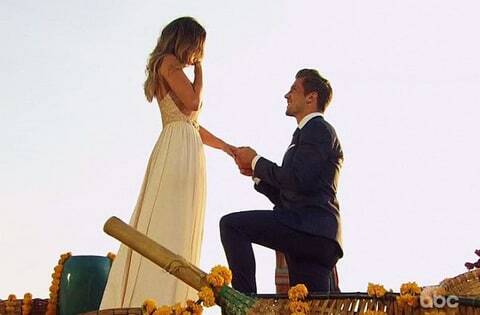 The Bachelorette JoJo Engagement Ring proposal by Jordan Rodgers. The Bachelorette JoJo Engagement Ring made by Neil Lane. Fletcher, 25, admitted that she was in love with the former NFL player, 27, just before he got down on one knee and presented her with a diamond engagement ring weighing in at more than 3.5 carats on the season finale of the ABC reality show on Monday, August 1st. 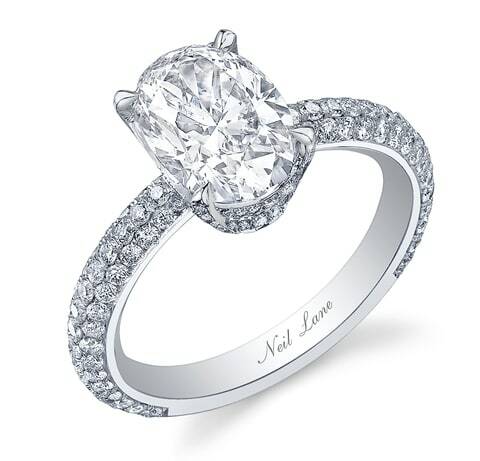 The Neil Lane bling, picked out by Rodgers, features an oval-cut center stone and pavé diamonds along the band. According a source, the ring costs about $85,000. The Bachelorette JoJo Engagement Ting in Platinum. Oval engagement ring in 14k rose gold by Ziamond Cubic Zirconia Jewelers. Ziamond features a very similar ring to Jojo’s and it features a stunning 9 carat oval engagement ring that is available in your choice of smaller and larger carat sizes to suit every lifestyle. It can even be custom made with any shape center stone you would like. Choose from luxurious platinum as The Bachelorette JoJo’s Engagement Ring or 14k white gold, 14k yellow gold or 14k rose gold. This engagement ring is also available as a set with a matching wedding band that features the same micro pave set styling that is simply breathtaking! The micro pave set Ziamond cubic zirconia line three quarters of the way around the shank. Get the same solid gold or platinum mounting coupled with the best possible diamond alternative for thousands less! Save a ton of money and wear the hottest new celebrity look worn by Blake Lively and now seen again by Bachelorette JoJo. This entry was posted in Celebrity, celebrity engagement rings, cubic zirconia, cz, Diamonds, Engagement, Gold, pave, Platinum, Rose Gold, Uncategorized, Wedding, Wedding Rings and tagged bachelorette, bachelorette jojo, bachelorette jojo engagement ring, bachelorette oval engagement ring, jojo fletcher, jojo fletcher engagement ring, jojo fletcher jordan rodgers, the bachelorette on August 3, 2016 by Victoria Foster.